Good news first: after trying for 2.5 hours I finally succeeded to install a new app and the latest EU map on the TomTom LIVE 1000. What you see above is only one of the silly status messages: there are no updates, and there are updates. Between this and success where a lot of "Busy, do not disconnect" messages without progress indicator. What do you think "myTomTomSA" means? My TomTom Support Application. It replaces TomTom Home which turned into an app trying to sell you subscriptions. 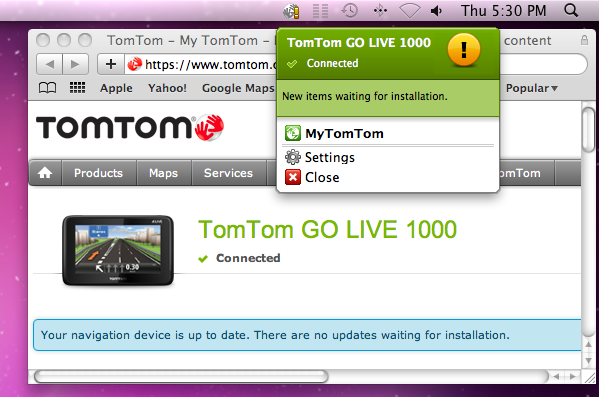 Since most of what has been available in TomTom Home is not available through myTomTomSA, things got worse. You can't even install voices you previously bought. The software simply isn't done. I continue to enjoy the device when I don't have to update it. The funniest thing is that the device has an Internet connection of it's own, but it must not update itself over this connection. I also continue to enjoy TomTom on the iPhone. Updates over iTunes App Store just work. Final note: even the latest map does not correctly show two streets where I live, four years after the streets were built. Despite multiple attempts to tell TomTom. I had the same issue using Safari on OS X with the latest builds, tried with Firefox and download as well as installation worked fine. It seems this functionality doesn't work with all browsers yet. it's a severy case of DKK hitting you once again right in the face, Volker. Have given up on the Navigon system I have, but not before "jailbreaking" it in order to understand the process. Now it's back to its original state. And I happily use iPhones en lieu of my fixed system that my car offers. Actually, Tomtom/Navigon on iPhones make up even for the severest case of lack of sense of orientation, like in my case. It really is remarkable how bad the TomTom software is. I avoid updating mine; I've turned it into a brick a few too many times.